I Toad You So: Simons Says, "Come Back to Visit." Simons Says, "Come Back to Visit." Although we had crossed (a brief drive over a well-manicured causeway) the moat, the castle bridge had been drawn and we were not visiting today. At least this is what we were politely told by the casually dressed guards, who more so resembled a cruise ship company's private island reception staff than keepers of the gate. I could almost swear I had stepped foot on or perhaps stuck a toe in the Atlantic via the beaches at Sea Island, Georgia at least once back in my road-tripping, island-hopping, beach-cruising days. I have most always found a way to gain access to any resort, not for any felonious purposes or to take undue advantage of any services or facilities, simply to check the place out in consideration of a future stay. This wasn't happening here as the dutiful guards/welcoming-committee gave us an 800 number and no further recommendation. Well, I hadn't planned for this. Of course, this was part of our unplanned four-day getaway (See Amelia Island - Beautiful Tennis Tradition and Joe's 2nd Street Bistro. ), for which we knew we would have success in finding most whatever we wanted in regard to accommodations, dining and entertainment, being that it was late August and we had done this before. Nonetheless, Sea Island has a very interesting history (See Sea Island), but you better plan your visit there unless you have $500 plus to dole out for a room on short notice and then you still may not get in. Though, it's worth it if you can. Fortunately, wonderful St. Simons Island (joining Sea, Jekyll, and Little Saint Simons islands as Georgia's Golden Isles), was just a minute away (much less actually). 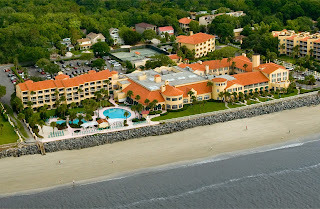 I somewhat had the feeling Sea Island was not to be our destination for our evening stay and this was confirmed when we met Richard at Frederica House. We weren't going to be served here either, for a different reason - Richard had just closed because the restaurant was between its lunch and dinner hours. But Richard served us in other ways as he gave recommendations for food and lodging (less than $500 a night), while also providing us with a colorful picture of St. Simons, as well as his restaurant and a local celebrity friend of his. Note: If you are an SEC fan and not particularly a University of Georgia fan, you may be taken aback by one or too many bulldogs in different forms and various sizes, scattered throughout the island. Get over it; it's just a pride thing for them. If you happen to see one of those darn football helmets at someone's bar, just say, "Gee, isn't that a nice letter." Get it? we went to Brogen's North, named so for its sister eatery, Brogen's, to the south. Remember, distance and geographical reference is all relative. 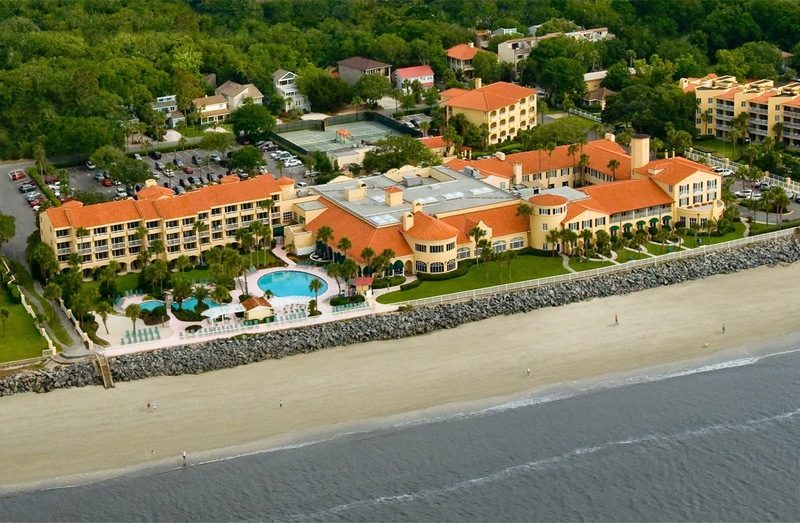 St. Simons is an island, but not on the same scale as Australia. If one stood atop the lighthouse near Brogen's one could probably see Brogen's North, if it weren't for the vast flora in between the two. I don't remember which burger I had at Brogen's North, but it was definitely fresh and a wonderful meal over all. On Richard's advice we checked into The King and Prince Resort, which we finally found after meandering through a few neighborhoods. On St. Simons, except for the northern region, you are never far from a neighborhood, a village or the locals. Our stay at The King and Prince, although short, was fantastic. The exterior and property lay-out is attractive, our room had this very open, airy feel and the staff we met was very friendly and accommodating. Yet, and a positive, one could throw a stick (not recommended) from the property and hit a local walking their dog or riding a bicycle. There are no true us-and-them (tourist-and-locals) type barriers here. That evening we ventured out for dinner, again with no planned destination, and ended up at Redfern Village (known as the locals' village - misnomer to me), one of a few such enclaves scattered about the southern side of the island. This village was a mix of boutiques, restaurants, professional and medical offices, an art gallery and other sundry businesses. After a few quick glances, we settled on Blackwater Grill, which was featured on a Diners, Drive-ins and Dives, Farm to Table episode, a few years ago. Our dinner was delicious and the service was good even after what I thought to be a "too casual, too local" of a greeting from our server. This feeling ebbed with time and some situational awareness. Thirty more minutes there are we would have been locals. Another Note: I grew up in the South and have not traveled nearly as much as many, but I have had the knack for finding the indigenousness (I made that up.) of most places I have visited, here or abroad (risky in a few cases). As the media may portray, by which Paula Deen may make seem believable with her slathered-in-butter-and-pork-fat Y'all, not everyone, in fact very few, speak li kat don her (like that down here) or much anywhere else in the Southeast. If it weren't for the footprint required by the airport, there would probably be a few more such villages. But, from what I have read and heard, the airport is worth more than it's acreage in the visitors, residents (a few or more celebrities - I'm not mentioning any names) and their money it brings to the island. These villages aren't peppered with little trinket stores or outlets like you may find in other coastal areas. These are fancy shops carrying unique and valuable brands and products. My girlfriend stumbled across an item while window shopping after dinner and we planned to return in the morning. I don't believe having breakfast out is a huge concern on St. Simons. I can't swear to it (Some reader will correct me - I'm certain), but after finding a small boutique coffee shop, where the sight of computer tablets being used and novels being read was much greater than the smell of bacon, home fries or waffles, and finding nothing else, we returned and had breakfast by the sea at The King and Prince. What we're we thinking? Before either heading back to Columbia or spending a day in Charleston before doing so, we rolled up to McRobins (Bear with the link as they are creating an e-commerce site.) back at Redfern Village. We met Wendy, a co-owner, who happened to mention that she has a large number of tennis players, both local and visiting for tournaments, who visit her store quite often. I had to love that. You also have to love their slogan, "Cotton People Love To Live In." My girlfriend put her name on a list for one of McRobins' best sellers and was contacted just a few weeks later to confirm the order, which she has since received. Like most of the stores we (she) visited, they seem to have been selling their wares for 20 to 30 years or more and haven't changed ownership once. Visit McRobins when on the island for unique clothing and accessories. Alright, so our tennis bags never made it out of the back of the car, but that's okay. The time spent learning and enjoying St. Simons and its people was well worth it. One can only play so much tennis. Yeah right. If you are an athletic type or simply love getting busy outdoors, there is plenty of this to be had on the Island, from golf and tennis to cycling and kayaking, or whatever else makes you breathe a little harder and sweat a little more. Obviously there are plenty of heart-pumping beach and water-borne activities. As for our final destination, I had to see Fort Frederica, which is on the most northern point of St. Simons. Being a guy, if this be such a predisposition, I have always enjoyed visiting forts. My girlfriend enjoys history and is game for most anything and we politely endure the others interests for which we are individually less inclined, with ease, just because we enjoy discovery. Perhaps there is just a being-together thing we cherish because such time has been limited the last few years. If not the case, she damn-well owed me for some clothes shopping time I endured. Fort Frederica, from my reading, held a very valuable place in the history of the holding of this area and the protection of Savannah, yet it was short lived and abandoned not long after its purpose. Short of the munitions stores (erect and partially intact) just off the waterway, it resembles more of an unearthing, an archaeological dig so-to-speak. But, if you take the time to read what the park service has so well provided, noticing the foundations of homes, other buildings and the once-established avenues and streets, you will gain the sense of what this was about and what took place here. 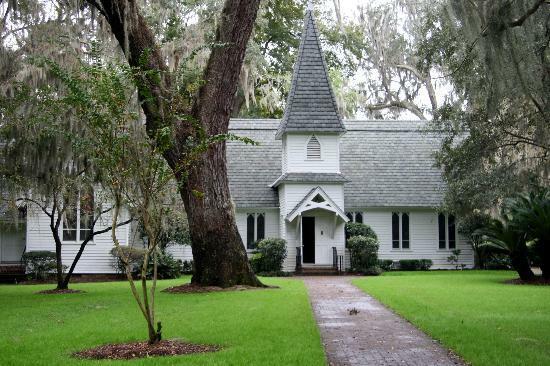 The drive to Fort Frederica, passing many of the well-established homes, neighborhoods and churches, below a canopy provided for by trees on both sides of the road, was just as beautiful as walking on the grounds of Fort Frederica. Also, there are more ample-width (well-off-the-curb) bicycling lanes along Frederica Road than you shake a tire pump at. Okay, so tennis was virtually null and void on this portion of our trip. I was so enticed by the well-kept courts at The King and Prince, but time and preference won out over any court-time. We will return to St. Simons, I am certain, within less than a year and we recommend you plan some time there if you have the opportunity. The people, service providers and businesses, most of them, will give you what little or wonderful attention you need during your visit. They've figured this out or know you will in short time. Either way, it may seem just right. If you want to get away, this is it. If you want to stay for a while, do so.